An idea created partly in response to the events of 9/11. I was considering the manner in which so many died on that day, and wondering: is it possible that a person can depart the physical plane so suddenly, that it may be unaware of the transition? In this painting, the man is standing on a rock which symbolizes the earth, and also the building’s ruble. He is holding onto a rope which represents his connection to life. He expects it to reach to the earth/physical plane. Instead, it circles back out of his view into the beak of the raven. Which throughout my work symbolize messengers from other dimensions and keepers of the mystery. 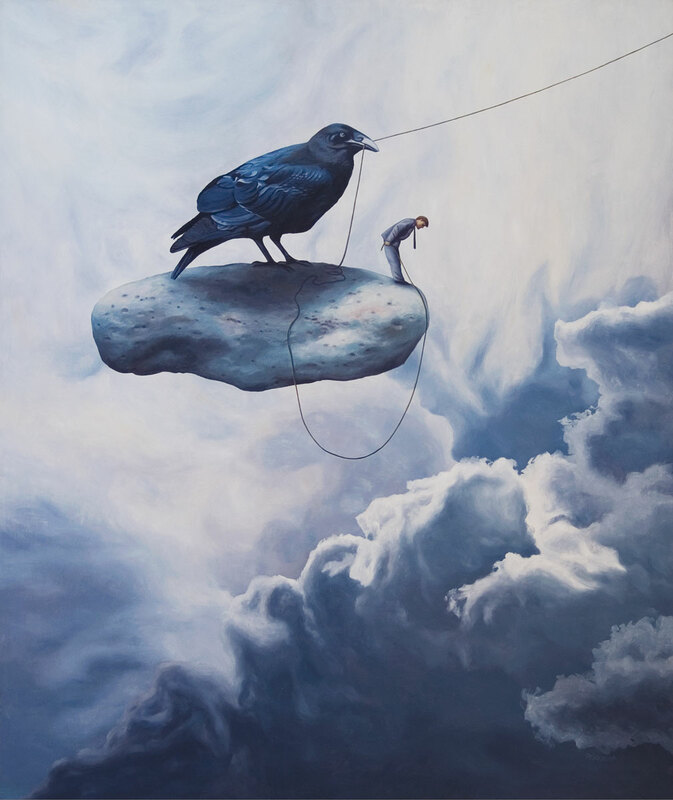 The rope then disappears into an unseen dimension as the raven ferries the man into the next life.